Gallery will be closed on the following: Sundays and Mondays, Easter holidays, Corpus Christi, 1st and 6th January, 1st November, 25th and 26th December. Gallery of Maria Ritter and The Old Bourgeois Interiors - this is an exhibition occupying four rooms on the first floor of Ritter's house (late 18th and early 19th century) on the corner of the Rynek Street and Jagiellońska Street. 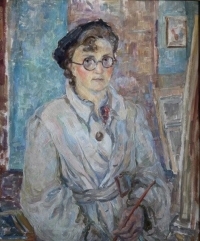 In the first room there is a monographic exhibition of the paintings of the outstanding painter Maria Ritter (1899-1976) and the equipment of her workshop (workshop materials). The green corner living room has a nineteenth century character (Biedermeier). Only the portraits of Maria Ritter presenting the 20th century. Another room - white - has a jukebox. It is equipped with light furniture, equipment and paintings, works of Feliks Hanusz, one of the first painters with academic education in Nowy Sacz. The exhibition closes the bedroom in the style of Louis Philippe with Viennese portraits of the painter's grandparents - Feliks and Józef Ritter. A number of family memorabilia and exhibits from this tenement house were used in the interior.